Skating has long been a social activity as much as a competitive one and it was very much owing to this social aspect that fours skating (a now defunct discipline that featured two pairs skating one program together on the ice in tandem) got its start. With its roots in English Style combined figures, fours skating emerged as a popular discipline in Canada in the early twentieth century. It evolved simultaneously at clubs in Toronto, Ottawa and Montreal and its popularity soon trickled down to clubs in United States. The Minto Four of Margaret Davis, Prudence Holbrook, Guy Owen and Melville Rogers were arguably the most successful pair, winning the North American Championships three consecutive times beginning in 1933. On fours skating, in her 1938 "Primer Of Figure Skating", Maribel Vinson Owen wrote: "A four, where two ladies and two men do combination skating, is always a favorite with skaters and audiences alike. The program, where moves may be done separately, in pairs, or all four together, is a fascinating problem of construction, while in execution complete unity of steps and skating rhythm plays an even greater part. Every four should have a 'leader' to direct practice and keep order, but in performance four people should skate as one." Fours skating's early beginnings consisted not of the free skating programs we traditionally think of in connection with the discipline but in actuality in the execution of school figures in unison. Irving Brokaw's 1913 book "The Art Of Skating" explains that in the Minto Skating Club's Grey Challenge Trophy event in fours skating teams were required to perform a specified series of figures: "F and F three about and F meet 5 2, F and IF Bracket and Once-back and F meet (four individuals), Once-back and F about and Once-back off meet, 'Twice-back and F and IF, center three and IB and IF and F meet 6, Total, 22. All of above figures to be skated to a center. 'Fours' comprise two pairs to same center and four individuals to same center." Later, the discipline would evolve into a single free skating performance (no short and long program) judged obviously for technical merit and artistic impression on a scale of 6.0 as that system was in place. The discipline gained some traction in other countries as well, including the Soviet Union and Germany but was mainly a novelty act used in exhibition performances. It was to my knowledge only ever contested internationally at the North American Championships (last in 1949) and Skate Canada International (last in 1990). After former CFSA President and later ISU Vice President David Dore won the Canadian fours title in 1964 with Bonnie Anderson, Laura Maybee and Greg Folk, fours skating was put on the back burner at the Canadian Championships for for almost twenty years. Interestingly, during the time period fours FIGURE skating's popularity lulled, it was very popular as a discipline in roller skating. In 1982 (the year I was born coincidentally), fours figure skating made a resurgance at the Canadian Championships in Brandon, Manitoba when Melinda Kunhegyi, Lyndon Johnston, Becky Gough and Mark Rowsom claimed the national title. Debbi Wilkes' show "Ice Time" in the nineties used to show plenty of great archival footage of eighties fours skating and the discipline was actually held consecutively every year from 1984 to 1997 after this revival in popularity, with many elite Canadian pairs skaters including Christine Hough Sweeney and Doug Ladret, Isabelle Brasseur and Lloyd Eisler and Jodeyne Higgins and Sean Rice all taking home MULTIPLE Canadian fours titles. Interestingly, when the event was last held at the 1997 Canadian Championships in Vancouver, B.C., David Pelletier took home the title with his partner Allison Gaylor and teammates Nadine Prenovost and David Annecca. The fact that fours skating never caught on with the ISU and thus was never contested at the World Championships surely played a major factor in the discipline's demise but one of the unfortunate things that I noticed time and time again in watching videos of fours skating was the fact that when you had four people on the ice instead of just two all doing side by side jumps or spins for instance, the odds of error were just simply mathematically higher and Murphy's Law usually prevailed. Keeping in mind that as fours skating would have been a "fun thing on the side" really for the majority of the pairs participating, when mistakes happened the programs simply weren't always trained enough that the skaters were able to bounce back from their mistakes gracefully without majorly disrupting the programs. 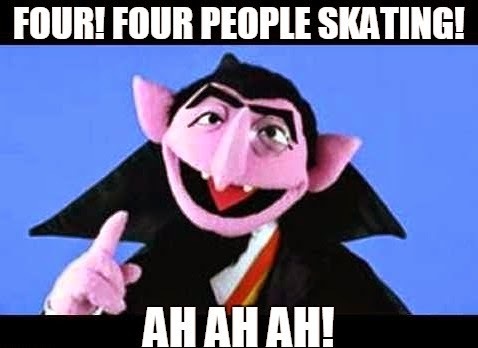 That said, fours skating was just so unique! You had double death spirals (two men lowering their female partners at the same time in the same pivot), people switching partners and four person pairs spins... just some really cool things going on! It's really a shame the discipline never caught on more internationally and kind of petered of although it's nice to see elements of fours skating resurface from time to time in show and ensemble pieces. Considering we're hedging on almost twenty years since the event was last held at the Canadian Championships, who knows? The cyclical nature of skating might see fours skating resurface at some point. It's anyone's guess. I'd be all FOUR it.